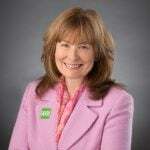 Leslie Chambers was appointed President and CEO of the American Parkinson Disease Association in August 2012, bringing to the role a rich background in successful leadership and management experience with more than 30 years the non-profit, voluntary health sector. During her tenure with APDA, Leslie has successfully led the organization through its first-ever strategic plan, resulting in increased patient-focused programs and services, educational initiatives and expansion of its research funding. Well into APDA’s next strategic plan, Leslie continues to push APDA forward with the drive and focus necessary to fulfill its mission of helping everyone impacted by Parkinson’s disease live life to the fullest. Leslie leads a team that is responsible for implementing the largest grassroots network dedicated to fighting Parkinson’s disease who work tirelessly every day to deliver impactful programs and services to local communities across the country. Prior to APDA, Leslie has held leadership positions with several major non-profit health organizations including the National Multiple Sclerosis Society, the Alzheimer’s Association and the Leukemia & Lymphoma Society. She earned both her bachelor’s and master’s degrees from the University of Massachusetts, in the fields of human nutrition and public health. She received an award from U Mass in October 2016 for Significant Contributions to the field of Public Health and Health Sciences from the Dean of the School of Public Health and Health Sciences. Leslie is a passionate advocate for the Parkinson’s community and looks forward to the day when the mysteries of Parkinson’s disease have been solved – once and for all.